Where does the United States fit into end time Bible prophecy? 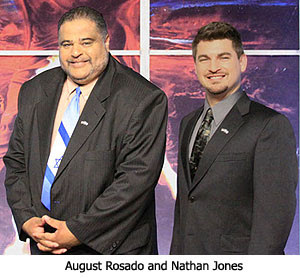 August Rosado: Many try to find the United States in Bible prophecy. They'll pull passages like Isaiah 18, and then they'll jump over to Revelation 17-18 and declare that the'vey found America in Bible prophecy. All the biblical scholars back through time never found the United States in Bible prophecy, but some today believe they've finally found America in the Bible. How do they even come to this conclusion — that they've found America in Bible prophecy? Are there are specific references to the United States in the Bible? Are there general references to America in prophecy? What do you have to say about that? Nathan Jones: Let's answer your first question: "Why are people always looking for America in Bible prophecy?" It's as if the United States is the only country on the planet. An Australian once wrote me and said, "American's always think they are in the middle of everything." That is so true. We are obsessed with the idea that America is in Bible prophecy. I think why Americans are so curious about the US being in Bible prophecy is because we interpret Bible prophecy based on current events. What is in the newspapers today? Right now, politically and socially, the United States exerts more power than any other nation. But, people have a hard time understanding that the Tribulation is a time period unlike any other. The total political systems of the world, the economic systems, the social systems, the religious systems — they will all be vastly different during the Tribulation than they are today. We can't look at the way the world is currently set up and conclude that today's world is also the world of the Tribulation, because the Bible paints a very different picture of what that future time period will look like than how it presently is arranged. August, to address your second question: "Where do people get the idea that the United States is in Bible prophecy?" Obviously, the Bible doesn't right out write "The United States of America" or any name similar. It's just not named, so people have to infer it in Scripture. The chapters you gave plus some others are the ones that I would have given that people look to. People turn to Isaiah 18 where it talks about a tall and smooth people who are feared far and wide that live in a nation which is powerful and a river divides it. People will then conclude, "Look! The Mississippi separates the United States. It is a powerful nation. Therefore, Isaiah 18 must be about the United States." But, you've got to look at context whenever you are interpreting Bible prophecy. We must look at the context, and that context is about the land of Cush, which is modern-day Ethiopia. The dividing river is the Nile River. So, Isaiah 18 clearly isn't a prophecy about the United States. A second scripture people will turn to find the United States in Bible prophecy is the mention of the village of Tarshish, which is found in Ezekiel 38. Ezekiel 38 concerns the Gog-Magog Battle, when Russia and an outer ring from Israel of Islamic nations will come against Israel. God will supernaturally destroy this vast army, and then the whole world will know that God is truly on the scene. The supernatural defeat is God's return back in the public's eye again. People will specifically read Ezekiel 38:13, which talks about the merchants of Tarshish and its villages, or young lions, depending on the translation. They will conclude, "Tarshish is England, therefore the young lions must be its colonies: the United States, Canada, Australia, and countries like us." Of any of the possible biblical reference to the United States in Bible prophecy, I would say that Ezekiel 38:13 is the best possibility. But, then again, we really don't know that Tarshish is England. The people of Ezekiel's time thought the end of the world — Tarshish — was Spain, so that would really make the young lions then the hispanic nations of South and Central America. Therefore, this verse then becomes a hard one to pin on the United States. Anyway, if Ezekiel 38:13 contains a reference to the United States, the country we are told in that passage sits the battle out and lets Russia and those Islamic nations attack Israel. These young lions sit out the battle and barely give it a protest, which when you think about it, sounds exactly like what our current administration would do. The third passage people go to in an attempt to find the United States in Bible prophecy is Revelation 12:13-17. There it talks about a great eagle, and the wings of the great eagle will carry the women Israel into a hiding place. In other words, the United States will step in and protect Israel from the Antichrist. But, we just have to go to Exodus 19:4 to realize the eagle isn't the United States. The eagle is talking about God. God is what protects Israel and takes her out of harm's way. Again, the United States is not a great force during the Tribulation that will be protecting Israel. As a matter of fact, all the nations of the world during the Tribulation we are told will be against Israel. The United States will be one of them. Speaking of the Tribulation, the fourth passage people look to find the United States in end time Bible prophecy would be Revelation 18, which talks about Babylon the Great. As you know, August, there are whole ministries dedicated to trying to prove that the United States is Babylon the Great, this great one-world harlot system that comes against Israel. It truth, it's a religious system as well as the Antichrist's political system. Again, the United States is one of all the nations set against Israel. It's not the Antichrist's empire that controls the entire world. So, to use that reference is really an attempt to try and pigeon-toe the United States into that Babylon entity. I don't believe that's the case there in Revelation 17-18. Clearly the Antichrist does not rise out of the United States. He rises out of the revived Roman Empire according to Daniel 9, so therefore I have to conclude that the United States isn't the one world religious or political system of the Tribulation time period. I do see the United States in some general prophecies, prophecies that don't state the United States specifically, but would concern the United States. Take for example Isaiah 34:2-3 which declares that all the nations will be judged for their behavior against Israel. Certainly when the United States tries to separate Israel's land and divide it — the Two State Solution — we always seem to get hit by God weather-wise as a reminder not to harm the "apple of God's eye." Isaiah 34 also talks about all the nations of the world ceasing to exist except Israel during the Millennial Kingdom, though there are some other references to Egypt and Syria bringing tribute to Israel during the Millennial Kingdom in another passage. If anywhere the United States falls within Bible prophecy, it's where all the nations of the world come against Israel during the Tribulation. At that time the United States will no longer be a friend of Israel anymore. It will be part of the Antichrist's government, and part of his empire. Whatever form the United States takes during that time period, it one will be part of the Antichrist's empire, and two it will be part of that satanic force that will try to destroy Israel. Unfortunately, that is the destiny of the United States. August Rosado: Yes, I agree with you there, Nathan. I was reading the Biblical Archaeology Review magazine. It's one of my favorite magazines for being updated on recent archaeological discoveries. Hershel Shanks did a segment on ancient Tarshish, and he said that archaeologists actually found ancient Tarshish, which is known today as modern-day Tartessos which is in southern Spain. But, these guys who try to find America in prophecy will say that Tarshish is Great Britain's colonies like Australia and the United States, founded by English speaking immigrants. That just doesn't fit the bill at all. Tarshish is located in southern Spain, not in America, not in Great Britain, and certainly not in Australia. Getting back to Isaiah 18, these guys who say they have found America there in that prophecy will also say that's America because it says "woe to the lands shadowing with wings," and wings are a symbol of the United States. Then as you said they go to Revelation 12 about the great eagle's wings and conclude that must again be referring to America. The main problem with their interpretation is that these guys allegorize and spiritualize the Bible to make it sound anyway that they want. In the fifth segment of August Rosado's and my discussion of current prophetic trends and events, we will ponder Irvin Baxter's claim that we are now living in the Tribulation and what the Bible truly says are the conditions of these last days. Now the GAY SCOUTS reign. If this doesn't prove the end times are here then nothing does. It's time for a Christian Boys Scouts. Let the Gay Boy Scouts rot. I think that all parents shouldn't let their children even join,, also if I had a son in it.. he would immediately resign from it..
You have a son in the scouts (if I remember correctly from a past post). Is there any "buzz" yet about this? I believe America is the Mystery Babylon of Rev. 17, 18. America is the only country in the world that meets the criteria of Rev. 18 Want proof? Read Rev. 18:4 carefully. It sure isn't Iraq...all Moslems there. Rodney, no one knows who the Anti-Christ is, and it sure isn't Obama...anyone with any intelligence would know that. t says in OBADIAH that the house of Israel will will come up against the house of Esau.... ever thought that the house of Israel is the USA CANADA BRITAIN AUSTRALIA AND NEW ZEALAND.....? Yes, my son is a Scout. Been so since a Tiger Scout. Are we to be concerned that we'll have open gays in the 6th-10th grades? Highly unlikely. Though troubled, I'm more troubled when Christians pull themselves and their influence out of society. We've circled the wagons, and in doing so have lost our voice in society. My son will stay in the Scouts. Bob H. I am not sure exactly what the verse stated, but isn't there one to come before the Antichrist, that Antichrist gives power to? I have a feeling that is who Obama is... for sure he is EVIL. A chill went down my spine the first time I heard his name, and that was when a co worker stated that he was running for Pres.. I didn't have a clue who or what he was.. I was asking God why I ever got into politics..and then I realized,, that if I hadn't felt that chill, I would have never started reading on the rapture. and now I read my Bible. I used to just vote for the one who didn't believe in Abortion, but now I know what is going on. I also google different things about the Rapture,, and also prophecy sited. I also read Rapture Ready religiously. I think the US will be part of the one third of the world population killed off when the rider of the black horse takes to the world. The major parts of Revelation and the other prophetic books of the Bible, talk about the countries in and around the Med, and middle east. There are hundreds, if not thousands of nukes out there right now, and soon or later, someone will let loose with them. Crank in the other man make killer bugs and I don't see very many people in this part of the world still being around once the Anti sits in the Temple in Jerusalem. The US has pretty much played it's part in world history and is about to be reduced to some thing less than a third world country. Just my thoughts. EZEKIEL 38-3, 4 is about leviathan....Job 4-1 speaks of leviathan and hooks...Isaiah 27-1 shows that leviathan is the dragon in the sea of Rev 13... The dragon and his gang is about Mohammed and Satan's war on Christians and the world..
Ezekiel 8-5...Then said he unto me, Son of man, lift up thine eyes now the way toward the north. So I lifted up mine eyes the way toward the north, and behold northward at the gate of the altar this image of jealousy in the entry. The image of jealous.....The image of jealousy is Satan and his gang posing as God, messiah and the gospel. This image of jealousy is Satan-dragon, Mohammed beast and Koran lie ...God has allowed his image of jealousy because Christianity has been so unfaithful as explained in Numbers 5 the test of unfaithful wife..
Koran is the book of curses that becomes bitter water when ingested....The faithful wife of Christ will not be hurt, but the unfaithful will be hurt, damned and blotted out of God's book the Gospel of Christ..CHRISTIANS BETTER WAKE UP QUICKLY..looks like time is short.. THE UNITED STATES IS CLEARLY MENTIONED IN BIBLE PROPHECY IN REV 13 IT IS THE LAMB LIKE BEAST THAT SHALL SPEAK AS A DRAGON WE NEED TO GET OUR HEAD OUT OF THE SAND AND OUR EYES OFF OF LITERAL ISRAEL GOD IS NOT GOING TO SET UP HIS KINGDOM ON THIS FILTHY PLANET HE DOES NOT CARE ABOUT THIS EARTHLY REAL ESTATE. HE CARES ABOUT THE PEOPLE ON THE PLANET AND THEIR HEARTS. GAL3 EZE 33 REV13 DAN 7,8. 2nd Beast is the US, comes from earth not like the rest that come from the oceans(which represents numerous peoples), 2nd beast came from 1st beast(roman catholic church, scarlet&purple adorned in jewels), that was hurt (1798 Papacy loses its power),has two horns (horns represent power Church&State)like a lamb(lamb=pure harmless,US founded on christian principles)speaks like a dragon. Why is the US setting up FEMA camps, buying all the ammo, and 30,000 guillontines?? Texas Lady Juanita here. All of the "anonymous" bother me. We must own the things we write. Other than Biblical reasons why America is not mentioned - I believe the rapture is pre-tribulation, and absent America's Christians America will sadly finish rapidly it's steady decline. We do not know the hour, or day, and I know that. We are to continue on our evangelical paths until He takes us up. I think the birth pangs are everywhere in the world. I thank the Lord for every day with my family. As much as we try to bring all of our kids into the fold, some may not make it. We must continue to evangelize and be in a state of continual prayer. i find it funny how people today try to make fulfilled prophecies can find their fulfillment in current events setting the stage for their fulfillment. Ezekiel 38-39 is the most misused for Babylon destroyed not only the temple, but the wall of Jerusalem as well. Nehemiah's scoffer when he was rebuilding the walls declared that the walls were so destroyed that if they could even make the rumble look like a wall it would collapse if just a fox would jump on top. the second temple was complete about half a century before the rebuilding of the wall would even begin thus making the events of Ester in light of the humiliation of the Persian army at the hands of the 300 Spartans seeking to find redemption in beating any foe even within the borders of the empire. Daniel 11 finds its fulfillment to the little details in the 2nd century BC. If these are still locked then we can not understand the prophecy, if they have been unlocked it changes what everyone thought. I believe these books have been unlocked when the Haiti earthquake hit and the birth pains started. I also believe that Dan 11 is referring to the US & Brazil (BRIC Nations). See this video and you'll see what I mean. America is the Whore and She will be nuked. I was out taking care of my Mom for a while. She is fine now. That is the reason for the late reply. Your son will STAY in the scouts. BUT what IF they accept gay LEADERS and start PROMOTING gays. Would your decision change? Just curious. You don't HAVE to answer of course.